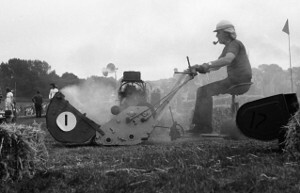 The British Lawn Mower Racing Associaton - How Did It Start? Lawn mower racing was started back in 1973 by an Irishman called Jim Gavin, who, with a bunch of mates had gone down to The Cricketers Arms in Wisborough Green, West Sussex for a few pints one lunchtime to discuss his latest motorsport idea. Jim was heavily involved in rallying and like all motorsport at this time, sponsorship was creeping in. Jim didn’t really like this and wanted to create a form of motorsport that didn’t involve lots of money and was readily accessible to everyone. As the pints flowed they looked out across the village green and there was the groundsman mowing the cricket pitch. It was then they realised that everyone had a lawn mower in their garden shed so they said “let’s race them”, and they did! They announced there would be a race in Murphy's field and about 80 mowers turned up! The main objectives were and still are, no sponsorship, no commercialism, no cash prizes and no modifying of engines. The idea being, it would keep costs down and resulted in lawnmower racing being described by Motor Sport News as "the cheapest form of motorsport in the U.K." The BLMRA still sticks to its origins as a non-profit making organization, any profits are given to charities or good causes. Lawn Mower Racing takes place all over the country from Wales to Norfolk and Yorkshire to Sussex, appearing at Country Shows, Fayres and Steam Rallies. We generally start racing in May through to October, incorporating The British Championship. We also have The World Championships, The British Grand Prix, The Endurance Championship and the most famous of all, The 12 Hour Endurance Race. 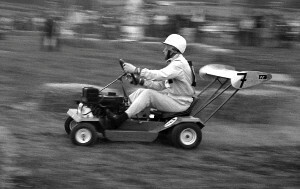 Over the years lawn mower racing has attracted motor racing legends and celebrities. Sir Stirling Moss has won both our British Grand Prix and our annual 12-Hour Race. Derek Bell, five times Le Mans winner and twice World Sports Car Champion, has won our 12 Hour twice and one of those was with Stirling. The actor Oliver Reed, who lived locally, regularly entered a team. We also feature in the Guinness Book of Records with the fastest mower over a set distance and the longest distance travelled in 12 hours. Other famous names who have been seen in the paddock are Murray Walker, Alan deCadenet, John Barnard (Ferrari F1 designer), Phil Tuffnell, Jason Gillespie, Chris Evans, Guy Martin and Karl Harris (British Super Bike riders), John Hindhaugh (Radio Le Mans commentator).